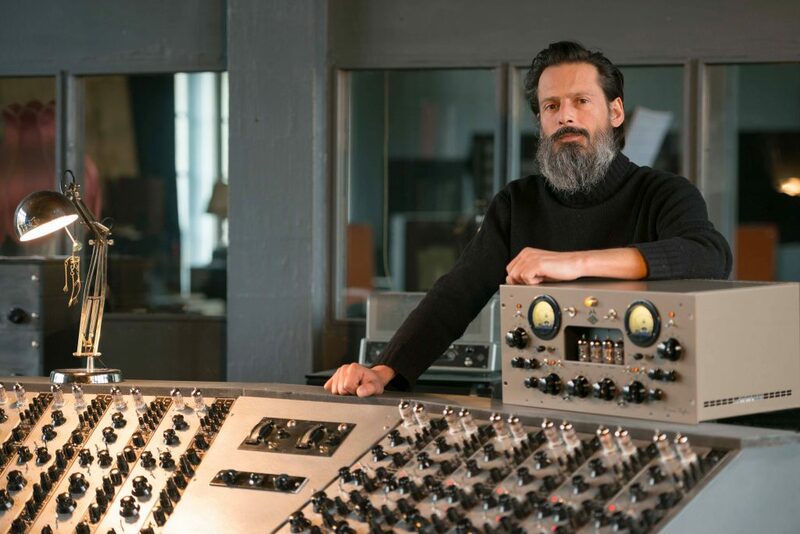 As part of the release of the two channel tube processor KERWAX Replica, manufactured in France by MULANN, we interviewed Christophe Chavanon, founder of the KERWAX studio, located in Loguivy-Plougras, Brittany. A one-of-a-kind residential studio featuring an exceptional collection of vintage analog devices, from tube preamplifier to tape multitrack, from Ampex to Studer, used daily for recordings. Hello Christophe, you are the creator of KERWAX Studio. Can you introduce yourself and tell us about your career as a sound engineer? I was born in 1973 and started practicing music at the age of 16 through guitar and bass. I immediately recorded my productions, first on a cassette Ghetto-Blaster (I loved the sound it produced), recording 1 track on the left then another on the right -not knowing what I did-, but experiencing a lot. Then, I evolved towards 4 tracks on cassette and then 8 tracks on tape. I recorded my personal projects and very quickly moved to those of my buddies with a snowball effect. It has never stopped since… and always on magnetic tape. What is the origin of the KERWAX studio? Why did you choose Loguivy-Plougras to settle? After various projects of artisanal home studio, we set up with my wife PWL Studio in Lyon. Having accumulated for years very specific analogue equipment, we quickly distinguished ourselves from the other French studios, which functioned mainly in digital. The studio existed for 6 years and became too small given the increasing demand. Having grown up in the country and my wife being of Breton origin, we naturally came closer to this land of music. The occasion made us find the ideal place in Loguivy-Plougras to install a studio that can welcome and accommodate musicians. How long have you spent collecting all these vintage devices? What great references make up your collection? What do you think are the qualities of these machines in relation to today’s digital tools? Undoubtedly non-linearity…! Their robustness and uncompromising design quality make them repairable machines, unlike the plug-in that become obsolete with the evolution of software. Digital is a simulation of these machines based on 0 and 1 which freezes the process. With analogue one can speak of a living sound, with the pleasure of working with his hands and ears rather than with his eyes as on a computer. We see on all sides the return of analog sound with the return of vinyl and turntables. Do you understand this craze? Yes, completely, the world needs concrete landmarks and understand the artists to immerse themselves in music: the pleasure of choosing the vinyl, listening it on the turntable, adjusting the volume of the sound, contemplating the cover, its graphics, the names of the musicians, of the sound engineers, of the label… This helps to make singular music and not a disposable consumer product like MP3, which is also the subject of serious studies about the auditory fatigue induced by this format. You have just finished editing your custom mixer. It was a long adventure! Tell us about his design. It was 3 years of reflection and development with the technical team of Kerwax, Olivier Pailler and Maël Bellec, both experts in electronics and lamp technologies. Like the studios from the 40s to the 70s where the consoles were built to measure according to a specification desired by the resident sound engineer, we worked to bring us closer to what I had in mind for years and that I had not found with the different consoles on which I had been able to work. It was a pharaonic project, very ambitious, and we are very proud to have completed it. The first goal was to be able to work the sound without limits by playing with the different stages of lamps and to be able to flirt with the distortion until the fuzz. Being a guitarist I always used to sculpt the sound with simple yet effective settings of tube amps. KERWAX Studio, in association with MULANN, launches KERWAX Replica. Can you tell us more about the genesis of this machine and its relationship with the mixing console? After all these fruitful efforts, it was important for us to make a rack-compatible version, a “replica” of our mixing console, an enhanced version with an additional function, the “Mid/Side” to make it a real effect processor. Why the Replica is a unique device on the market today? What are its main functions? It is an independent 2-channel tube processor with 2 modes: L/R (left-right in dual mono) or M/S (Mid/Side). It can simply be used to “warm up” the sound or to explore more extreme territories in terms of distortion. Thanks to its design and ergonomics, you have access to the front lamps to change them and test the signature and sound characteristics of each manufacturer. The Replica comes with 12AX7 lamps but you can also use 12AT7 to achieve faster saturation. It features a Trim in the first vacuum tube stage with bias control, a Baxandall-type EQ, and a second vacuum tube stage with lamps for the Drive. For which musical styles is the Replica appropriate? There is no restriction of use, all music can pass through the Replica and come out more generous. Who can use the Replica? Under what conditions? What are the first feedback from users who have experienced it? What are the advantages of Replica to competitors such as Thermionic Culture Vulture? The TCV is really oriented as a distortion processor. With the Replica, you have a wider sound palette and a more creamy distortion. Moreover, the other machines on the market offering harmonic distortion are rather more dedicated to the mono treatment of individual tracks. With the Replica you can process the signal in dual mono, stereo L/R and Mid/Side on an entire mix. Tell us about the use of the Replica in mastering. Is it a good tool to improve its mix? You have the possibility to enlarge the stereo image while keeping the center well present, or strengthen the center to bring out the voices, for example. It is very practical and always musical. You can bring roundness or air through the EQ, as well as natural compression and typical grain of the lamps. The design of the Replica is beautiful and seduces a lot. It has both a vintage side and a very modern look. How did you conceive it? What are your inspirations? I studied applied art and I am particularly sensitive to the car and furniture design of those years. The Replica is a nice machine and rather heavy, 11 kg, it is sturdy! Why has it been created in these dimensions and with such solidity? The internal electronics is of high quality and without revealing the secrets of manufacture, how did you conceive and choose it? What makes it so powerful? Secret, secret… but the shortest path is often the best in audio. We opted for a balanced version without transformers! The Replica can be seen as a simple distortion and vacuum tubes device but many see it as a creative tool and an instrument of its own. What do you think? It is surely because it is a device with which one can play and make music, it is not confined to a single function as a compressor could do it. MULANN manufactures the Replica in Lannion, in Brittany, how was your relationship created? It is a trusty relationship that started with magnetic tapes: we are users, they are manufacturers. Moreover, the interest they bring to analog audio is without measure, they want to explore and create by putting forward a know-how comparable to haute-couture. Where can I buy the Replica today? Is it distributed worldwide? What other projects do you have in mind? The Reverb is life? Yes, “La Reverb c’est la vie” is a project of a double mono vacuum tubes reverb with different resonators (springs, plate…). The prototype was presented at the AES Paris and Los Angeles and should see the light in the coming months.